Jose Mourinho. The name incites fear and admiration in equal measure. Now he's back at the helm of his favourite club is there anyone who can stop him? Chelsea have hardly had a lean spell since Mourinho, with trophies acquired under Ancelotti, Di Matteo, and Benitez, but only once since 'the translator', left the club in acrimonious circumstances, have they lifted the holy grail that is The Premier League trophy. This is not solely down to the manager as many fans would like to believe, but more the playing staff which are so important and particularly where they play. 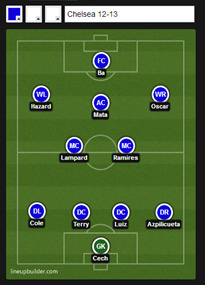 The major change in Chelsea's style since Mourinho left is the use of out-and-out wingers. When Mourinho won the league in 2006, he had a flying winger in the form of Arjen Robben, consistently chipping in with goals and assists, while an in form Joe Cole provided defender-shredding dribbling on the other flank. Since the departure of 'the special one', this has changed. Although wide men have remained at the club, their usage, and right to be defined as out and out wingers is subject to debate. After Mourinho went, Arjen Robben left for Real Madrid, taking a huge attacking presence out of the line up. Joe Cole hit a succession of injuries and poor form before being sold to Liverpool. Meanwhile the like of Sturridge, Kalou and Anelka were forced to fulfil wide positions, when each and everyone of them defines themselves as a central striker. Each of them has now moved on to pastures new. The revival is well under way however. With the additions of Oscar and Eden Hazard, Chelsea once again have the threat from wide that they once did. Andre Schurrle and Victor Moses will likely play back up to these two, but still possess the ability required to terrorize Premier League defenders. In a team which will afford them the creativity and freedom they crave by being so defensively sound (As Mourinho will undoubtedly make them) you can guarantee Chelsea will be right up there for the league next season. Whilst their formation of dominating the central midfield has made them hard to beat, it has clearly suited them more to cup than league football. In a do-or die game, they have only had to score one goal to go through, as was evident in their 2-0 victory over Barcelona at the Nou Camp in their Champions League winning season (Torres' goal was merely an icing on the cake). This was because their solidity in the centre of the pitch made it hard for teams to play their way through and score. Indeed this is how they kept themselves in touch during the epic champions league final in Munich. What is needed in the Premier League however is goal threat. Many teams would turn up to Stamford Bridge hoping for a draw, so when Chelsea march out with no real width, they cannot work the ball around the tightly disciplined opposition and stretch them enough and create chances to win the game, resulting in dropped points. This adds up over a league season and explains their inability to win the league, whereas teams will become more open in cup games which are win or bust, enabling Chelsea to score counter attack goals, or simply exploit gaps that might not appear in a league game. It is width then that will return Mourinho to God like status. And he seems to be taking the helm at the perfect time, when the club's fantastic new wingers have bedded in for a season, while he can add his own men too. With his ability to tighten up the blues' defence, Chelsea may well have the Premier League trophy in their hands again in May 2014.